Programme and abstracts of the 2013 International Congress of Odonatology, held in Freising, Bavaria, Germany, from 17th to 21st June 2013 and followed by a Post-Congress Tour based in Laufen, Bavaria, Germany, from 22nd to 26th June 2013. 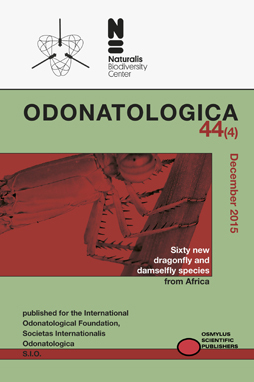 Free, low resolution PDF of Odonatologica Vol. 44(4), published 1st December 2015!